It was about 20 minutes before registration closed on Thursday evening that the BVI’s oldest Olympian, Dr. Robin Tattersall, who was on the territory’s first Olympic Gams Sailing team in Los Angeles in 1984 and again in Barcelona, 1992, showed up to collect his registration packet, to compete in the 47th annual BVI Spring Regatta. After competing in 44 of them, this year was to be the 87-year old ‘retirement.’ However, just two days before registration, the competitive urge cut through the retired surgeon and he was lured back to his comfort zone. Dr. Tattersall who as the regatta’s oldest participant, said he’s be very happy if he could just “climb off the boat” at the end of the regatta. It was more than comfortable. Tattersall, 87, the oldest sailor on the water, won all six races in Bareboat 3, on the rented Sunsail 41, Gatos del Sol/Makin’ Memories. 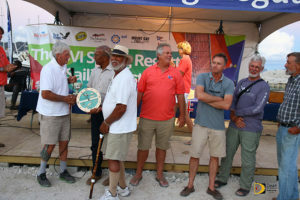 He also picked up the Best BVI Boat award. Brian McCarthy on a Sunsail 41, Team Miami/ZZ Hull 313, followed with 14. 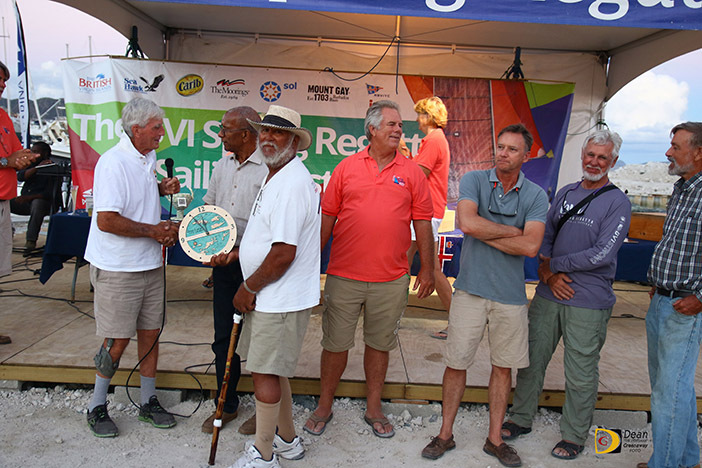 Other BVI sailors also won their divisions. The duo of Chris Haycraft and Richard Woolridge had six picket fences in the Performance Cruising class on Godspeed to seal the division. John Cook’s Beneteau Cyclades 50, Tatonka and Patricia Nolan’s Oceanis 440, Moxie/Alice D, were tied with 15. The BVI’s Eddie Brockbank’s Corsair Sprint 750, Lucky 7, had four successive victories to win the Multihull Division with seven points. The USVI’s Joseph San Martin’s Newick Teegul Tri, Piglet, fended off the BVI’s Barney Cook’s Corsair Sprint 760R, Airgiam for second by a point, 14-15.